Start and Finish area is at Kilyos football area. Please click here for the map. Race BIBs will be distributed at 10:00 am on race day. Race will start at 11:00am. If BIB numbers are not received by athletes by 10:00 am, athletes will not be allowed to start the race. Therefore, teams will have to be at the race area at 9:30am. 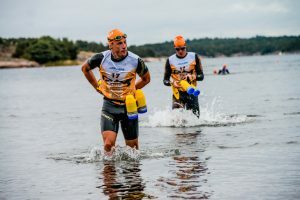 Team: SwimRun Challenge is a team race. Same genders (man-man, woman-woman) or mixed genders can be raced. First race is limited to 50 teams. Courses : Riva Swimun will sprint race. Safety: All swim courses will be on Black Sea. Swim will be on various bays and there will be referee on each swim entrance and exit. Moreover, there will be canoes on each swim section for safety. Nutrition: Since the race is a sprint, there will be no aid stations. There will be food at the start area. Course: There are red marks generally on run courses in adeventure races. And these markings are sometimes left behind and cause pollution in the natüre. Therefore, to protect the natüre, we will not use any plastic marking. Only swim start sections will have flags. There will be no other signs. How do I find my way then? As the technology progressed, smart GPS watches are more prevalent and these watches can have GPS tracked information to guide their users. As the race organization, we decided to use this technology. All athlethes will download the course from our website before the race and will follow this route during the race. All team members have to wear wetsuits. Our recommendation is the shorty with 2-3mm thickness. Athletes can also wear full wetsuits but it is not recommended. All compress socks are allowed and it is recommended by the race organization. Athletes will have to swim with their running shoes as running will start immediately after swim and it is a moving target race. During swim, it is allowed to have pullboy and swim pedals. It is even mandatory. For each team to find the route, wearing a GPS watch is mandatory.